This photo was taken at the Fleisher Art Memorial in Philadelphia. This space is kind of amazing. It is an art school that consists of four buildings attached to each other. The building in the center, known as the Sanctuary, actually used to be the Episcopal Church of the Evangelists. This space can be rented or weddings and events. It is a very ornate structure designed in an Italianate Romanesque Revival style. 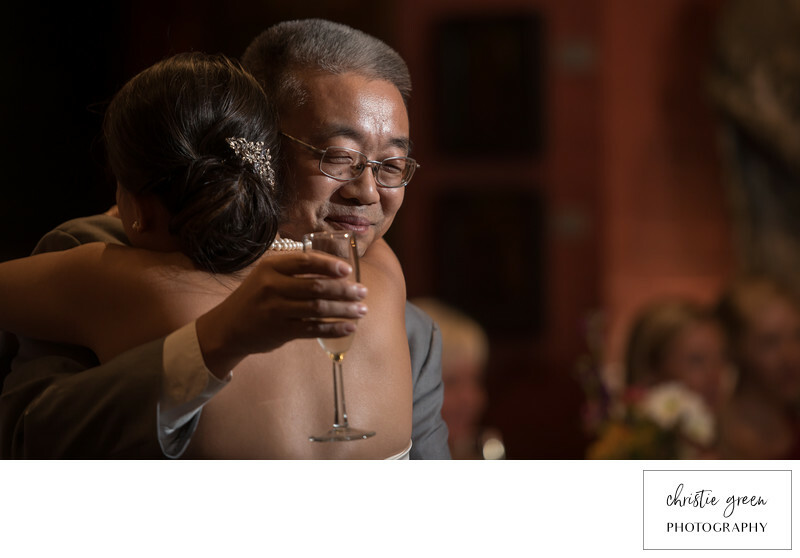 This photo was taken of the father of the bride giving his daughter a hug after his speech. He spoke very little english and spoke so sweetly about how his daughter never gave them any trouble growing up. He was overjoyed to be watching her get married. I love this moment between the two of them. You can really feel a sense of his pride and joy on his daughter's wedding day. Location: 719 Catharine St, Philadelphia, PA 19147.